Moon most immediately rewarding of all telescopic objects. Others give up their secrets reluctantly, and you have to learn ‘how to see’. But even at low power or in binoculars there is a rich variety of lunar detail on view. Backyard telescopes cannot match the detail shown by space-probe imagery, but they do reveal the ever-changing lunar landscape, as the Sun’s angle of illumination varies. You rarely see the same sight twice, and there is always something new to discover. Most telescopes are suitable for lunar study. If you use an achromatic refractor, beware of false colour generated by the Moon’s brightness. Go for one with a longer focal ratio (f/12-f/15). Use a sensible magnification that matches the seeing conditions. 30x per inch of aperture is usually about right (i.e. x180 for a six-inch telescope; x240 for an eight-inch). Moon filters can reduce the glare from the lunar surface (which, unlike sunlight, is harmless), However, they are often of poor quality and can reduce contrast. Try upping the magnification instead. Colour filters useful in bringing out the Moon’s subtle hues. Best lunar atlas is Antonin Rukl’s Atlas of the Moon (Sky Publishing, 2004). However, this is now out of print and commands high prices second-hand. The latest, digitally enhanced version of The Hatfield Photographic Lunar Atlas is still useful, despite its venerable age. Try also Charles Wood and Maurice Collins, A 21st-century Atlas of the Moon (Lunar Publishing, 2012). Good, uncluttered lunar maps are published by Sky Publishing Corporation and the BAA. We now know these to be the results of catastrophic impacts by comets and asteroids that occurred for the most part between 3.5 billion and 4 billion years ago. Some are relatively ‘recent’ (but still hundred of millions of years old). A very small number are of volcanic origin. Craters are of two broad types: simple and complex. Simple craters are usually small (under 20km diameter), and take the form of straightforward bowl-shaped depressions with a raised rim. 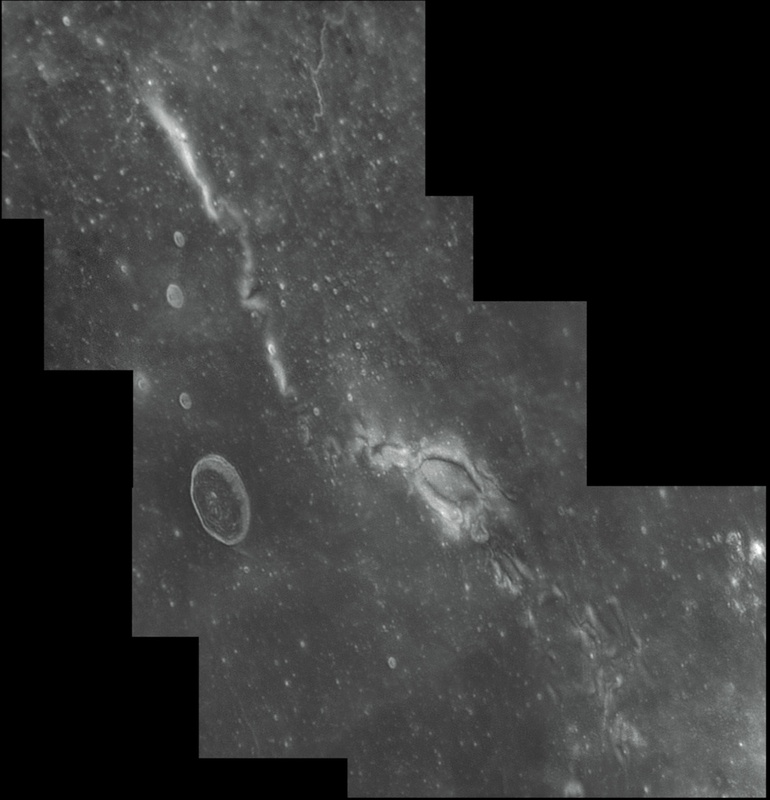 Complex craters are larger and show a more variegated morphology that may include terracing, central peaks, and floors flooded with impact melt. Older craters have often been extensively modified by ejecta from subsequent impacts or by flooding by marial lavas. These are not ‘seas’, as the ancients thought in the pre-telescopic age, but vast lava plains that have filled ancient impact basins. As they postdate those impact basins, they have fewer craters on their surface. The Moon’s mountains are just as impressive as the great terrestrial ranges, but they were formed in a different way. As there have been no plate tectonics on the Moon, the lunar mountains are not the result of uplift or folding of the crust. They are simply the rims of vast impact basins. Sinuous rilles (e.g. the Hadley Rille) are lava tubes. Arcuate rilles (e.g. the Hippalus rilles) are stress cracks at the edges of maria, where the weight of marial lavas has caused the mare floor to subside. Linear rilles (e.g. the Ariadaeus Rille) are graben, caused by tensional fractures leading to the slumping of land between parallel faults. Crateriform rilles (e.g. the Hyginus Rille) are chains of volcanic calderas. Rilles in highland areas (e.g. Janssen) are infrequently found and hard to account for. Best example are the Tycho rays. These represent relatively fresh ejecta from more recent (but still ancient) impacts. They are bright because the ejecta has not been darkened by space weathering as much as the surrounds. The irregular patterns displayed by some ray systems can reveal instances of highly oblique impacts. Best-known example is Reiner Gamma, but we should look out for others as not many are known. These are often associated with localised magnetic fields. Bill Leatherbarrow is the Director of the BAA Lunar Section. Brian Faulkner, James Dawson, Simon Marsh.